In the article, the authors—both of whom previously occupied prominent positions at the Food and Drug Administration (FDA)—take a close look at three important initiatives that have been advanced by both FDA and Congress to improve regulatory efficiency and predictability in the inspection of medical device facilities: the Program Alignment Initiative, the FDA Reauthorization Act of 2017 and the Medical Device Single Audit Program. Nathan A. Brown (left) is a partner in Akin Gump's health care and life sciences practice who focuses on food and drug law. He formerly served as an FDA detailee as health policy advisor to the Senate Health, Education, Labor and Pensions (HELP) Committee and as a special assistant to the FDA chief counsel. 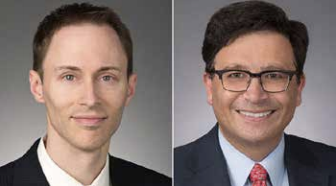 Howard R. Sklamberg (right) is also a partner in the firm's health care and life sciences practice focusing on food and drug law. From January 2014 to April 2017, he was the deputy commissioner of regulatory operations and policy at FDA.